Assisted Living communities are supportive, home-like residences for elderly people who may require assistance with activities of daily living. Depending on the individual’s capability, dog visits are organized either as a group activity or, if necessary, in a resident’s room or apartment. Main objective of the program is to provide a relaxed and 'dog-friendly' atmosphere, which allows students to practice the skill of reading. Many of the children chosen for this program have difficulties reading and as a result have developed self-esteem issues. They are often self-conscious when reading aloud in front of other classmates. By sitting down next to a dog and reading to the dog, all threats of being judged are put aside. The child relaxes, pats the attentive dog and focuses on the reading. Reading improves because the child is practicing the skill of reading, building self-esteem and associating reading with something pleasant. Approximately 20 Therapy Dogs International volunteers and their dogs responded after the Oklahoma City bombing in 1995. 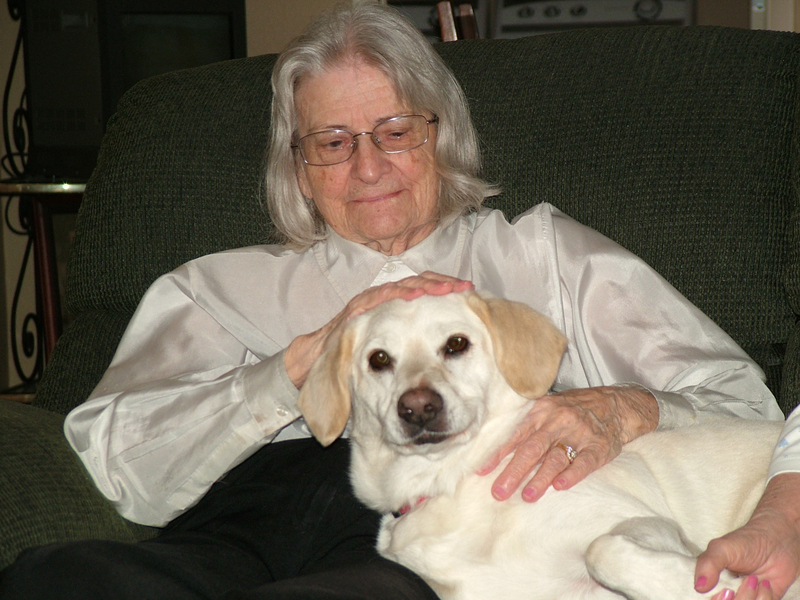 Whether a hospice patient, an aging patient or a disabled individual, TDA volunteers hope to improve their quality of life by bringing their Therapy Dogs to their home where the person feels most comfortable. Often, TDI dogs add a sense of normalcy. Their visits help people feel as if their lives are a little better and at times, more complete. Life may seem more manageable, especially to one who has to stay in bed, if they spend some time with Therapy Dogs. 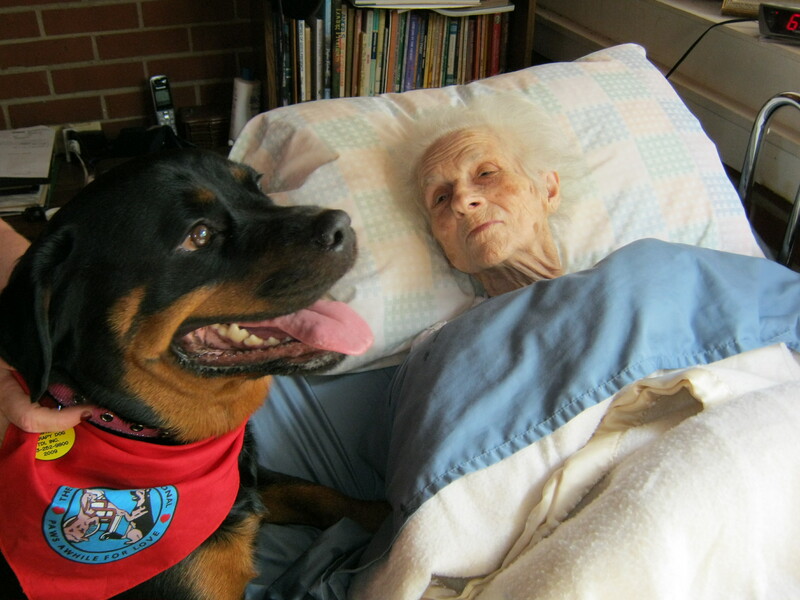 TDI visits help to promote healing because the patient is able touch and pet the dog. This allows them to feel like everyone else and their happiness and contentment helps them to do better. TDI is able to make a tremendous difference to any hospice program by providing comfort, love and companionship through the use of our dogs. Its goal is to enrich the quality of life for the hospice patient and their families. The sight of our dogs and the touch of their fur often brings peace and joy to those patients whose life once included animals. Physical contact has a calming effect and dogs have the ability to bring back pleasant memories of a person's life. Therapy dogs help combat loneliness and they give people the chance to have something to look forward to. Exposure to these dogs allows the patient to feel needed and wanted at a time in their life when death is evident. TDI has been doing a wonderful job for many years, working with handlers who wish to share their patient and kind dogs with children who are hospitalized. Having therapy dogs in the hospital helps normalize the setting for children who are away from home under scary and unpleasant circumstances. Often staff and parents get as much out of the visit as the children do. The optimism and happiness a Therapy Dog visit can provide to a patient is one that cannot be measured by a doctor’s instruments or recorded on a patient’s chart. However, it is clear to those who have had the experience of a Therapy Dog visit that a friendly visitor with a wagging tail can make all the difference in the world. Therapy Dogs International’s “Tail Waggin’ Tutors” program encourages children to read by providing a non-judgmental listener and furry friend to read to that won’t laugh at them if they make a mistake or stumble over a word, but rather lie next to them and enjoy the story being read to them. The children learn to associate reading with being with the dog, and begin to view reading in a positive way. Over time, the child’s reading ability and confidence can improve because they are practicing their skills, which will make them enjoy reading even more. It is profoundly moving to see how dogs have the ability to help calm and soothe agitated individuals while lifting the spirits of those who are sad and lonely. They provide a medium for physical touch and display affection for those who have lived isolated lives. The mere presence of a dog raises the spirits of a person and the petting and touching of the fur allows one to have a wonderful object toward which to express their affection. Therapy Dogs elicit responses from some nursing home patients who are typically withdrawn and limited in their abilities.Stroking the back of a dog leads to more movement from the patient and consequently, increased physical activity. The introduction of dogs increase interaction among individuals and promote a positive change in self-esteem. TDI dog/handler teams often participate in educational programs at schools. Therapy Dogs offer victims of abuse unconditional love and warmth at a shelter. When someone flees their home due to abuse, they don't leave with any comforts of home - at most a suitcase. Many times they leave their beloved pets behind. Therapy dog handlers can sympathize with this attachment to animals and can offer our dogs to be a comforting substitute. As women and children pet the dogs, they share their stories and emotions. Counselors are present to support the women and children, the dogs are present to offer themselves, and handlers support the dogs and lend an understanding ear. Conversations cover topics from cooking to pets to relationships, clothes, and jobs. The dogs offer a distraction from reality and a friendly paw. Although it can be an extremely somber occasion, a gentle Therapy Dog can be an asset during this time. They bring unconditional love and help to lighten a mournful atmosphere while bringing peace to individuals during an upsetting time.